While sections of the ILP movement points to ‘non-Indian’ outsiders as its primary concern, that’s a narrative of tactical convenience, given Manipur’s present political status vis-a-vis the Indian Union. 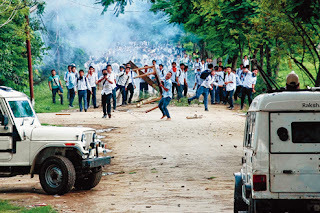 Manipur’s Imphal valley, is witnessing an extraordinary mass movement around the Inner Line permit (ILP) issue, in the face of relentless curfews and Khaki violence. Protesters have been killed and wounded. We remain blissfully unconcerned because no senile ‘Gandhian’ or NCR candle-holding or tricolour self-righteousness is involved. The ILP is an Indian Union government issued travel document that outsider Indian citizens need to enter Arunachal Pradesh, Mizoram and Nagaland (except Dimapur). The non-partisan civic-political coalition called JCILP wants the ILP system to be promulgated in Manipur too. The ILP system was introduced during the late 19th century when the British were making new territorial acquisitions in the present day Northeast by force and adding these newly acquired areas to what they called India. The ILP was partially developed to secure British commercial interests by maintaining peace without spending resources. British acquisitions that were beyond the inner-line enjoyed considerably more internal autonomy than their Indian counterparts. Such ‘Swaraj’ lapsed with New-Delhi raj. In 1949, the unelected King of Manipur was virtually detained in Shillong and allegedly forced to sign a merger document with the Indian Union. At that time Manipur had a democratically-elected representative sovereign government in place, led by the Praja Shanti Party, which was of course dismissed by democratic India. New Delhi sponsored democracy has been unstoppable in Manipur ever since. Manipur has no ILP system because it was never part of British India. When the British were busy expanding their India into these areas, the sovereign rulers of Manipur managed to largely preserve Manipur’s centuries’ old distinctiveness, politically, demographically and otherwise. After the 1949 merger, it had no method of regulating the entry of outsiders. The ILP demand is about preserving the communities whose homelands are in Manipur. The ILP demand stems from the reasonable anxiety of being destroyed by superior numbers. The population of Uttar Pradesh is 75 times that of Manipur. But aren’t we all Indians, from Kashmir to Kanyakumari? Whether we are one people or not, depends on who you ask but what’s certain is that we are co-citizens. The youth of Imphal do not enjoy the freedoms available to the youth of Delhi. Probing those differences may uncover unpalatable truths. Hence, Indian Union’s ‘national’ media showers more concern on the treatment of Manipuri students in Delhi than the condition of actual Manipur. For communities who once enjoyed autonomy to suddenly become ‘small’ or even minority in their homeland is extremely destablising. While the Constitution shows no concern for demographic anxieties within subsets of its population, the anxieties are real, especially in the backdrop of widely varying poverty levels, employment opportunities and total fertility rates from Kashmir to Kanyakumari. Phizo, the Naga statesman, stated in 1951 that “we can easily be submerged and get lost: our culture, our civilisation, our institutions, our nation and all that we had struggled and build up as we are today will be perished without the least benefit to mankind” (emphasis by the present author). No one wants to become a pariah in their homeland. It’s this humane plural vision of the future, to live and let live, that has to be remembered. Can Tamils imagine becoming minority in Tamil Nadu? Can that ever be a good thing? If such a scenario threatens to emerge, can we even imagine the kinds of forces that will be unleashed as a reaction? No people should be pushed to such a corner. ILP for Manipur is an idea whose time has come.